Prime Minister Sheikh Hasina on Sunday reiterated her firm commitment to give a ‘bright future’ to the children by building Bangladesh as a developed and prosperous one freeing from hunger, poverty and illiteracy. 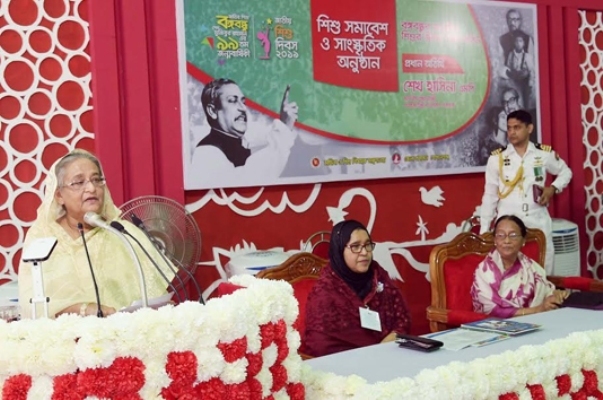 “We have been working with a target to give the children a bright future and shining day in future by building Bangladesh a developed and prosperous country as dreamt by Father of the Nation Bangabandhu Sheikh Mujibur Rahman,” she said. The prime minister said this while addressing a Children’s Rally and Cultural Programme as the chief guest marking the 99th birthday of Father of the Nation Bangabandhu Sheikh Mujibur Rahman and National Children’s Day on Bangabandhu Mausoleum Complex premises at Tungipara in Goplaganj. “We have to take steps to present our children a healthy life and ensure their peaceful stay with their parents,” she said, urging everybody to give special attention to their children. the function as the special guest.